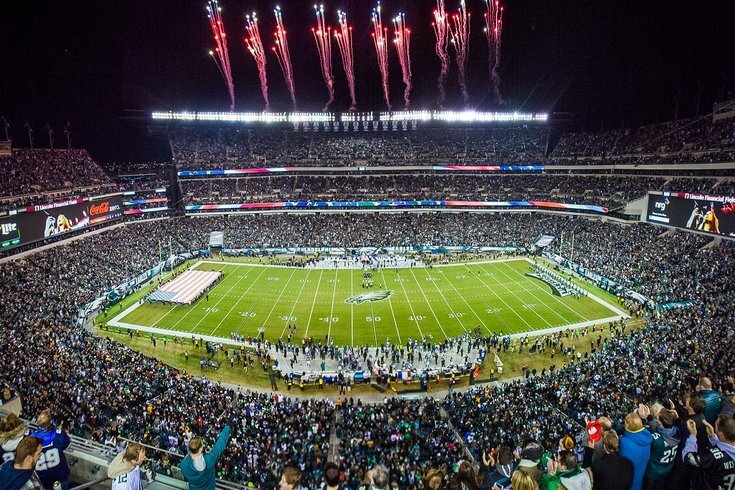 A stitched panoramic image from of Lincoln Financial Field in South Philadelphia taken on Dec. 14, 2014, during a game between the Philadelphia Eagles and Dallas Cowboys. A panel of Pennsylvania judges has rejected a man's argument that he had no idea the Philadelphia Eagles tickets he sold outside Lincoln Financial Field before a 2016 game were fakes. In a decision filed Friday, the three-judge Superior Court panel denied Derrick Smith's appeal of convictions on theft charges, affirming a trial court decision that stated Smith's defense of being none the wiser about the fraudulent tickets was not credible. Smith sold two tickets for $300 to Swainetta Bowens before the Eagles played the Pittsburgh Steelers on Sept. 25, 2016. Bowens gave the tickets to her son and his friend to attend the game, but they returned to her after being denied admission because the tickets had already been scanned or were duplicates. Bowens flagged down a police officer and pointed out Smith. Smith said he had bought five total tickets for $575 but didn't know if they were genuine or not. He said he told Bowens he'd be located in the same spot he sold the tickets in if she had any problems with them, gave her a business card with contact information and promised to reimburse her if they were fake. Bowens did testify Smith had promised to meet her in the same spot and to reimburse her for the tickets if they didn't work. However, Smith was tried and convicted on counts of theft by unlawful taking, theft by deception, receiving stolen property and forgery, receiving a sentence of 11 1/2 to 23 months in prison plus three years’ probation. On appeal, Smith argued that he would not have hung around, given the business card and offered a refund if he knew the tickets weren't legit. But the panel of judges wasn't having it, pointing out that Smith claimed to have been in the business of selling tickets for nearly four decades. "Specifically, Smith testified that he had been in the business of reselling tickets for 38 years," Judge Anne Lazarus, who wrote the decision. "Nevertheless, he claimed to have purchased five tickets, for a total of $575.00, without first ascertaining their validity." Lazarus added that Smith's offer of a refund could even be interpreted as him knowing the tickets were fake before selling them. The panel upheld Smith's guilty convictions, ruling he acted with requisite criminal intent to support the charges against him.